I do believe, that with the possible exception of cryptrover, almost every roguelike I’ve noted on this site has had some sort of fantasy theme to it. 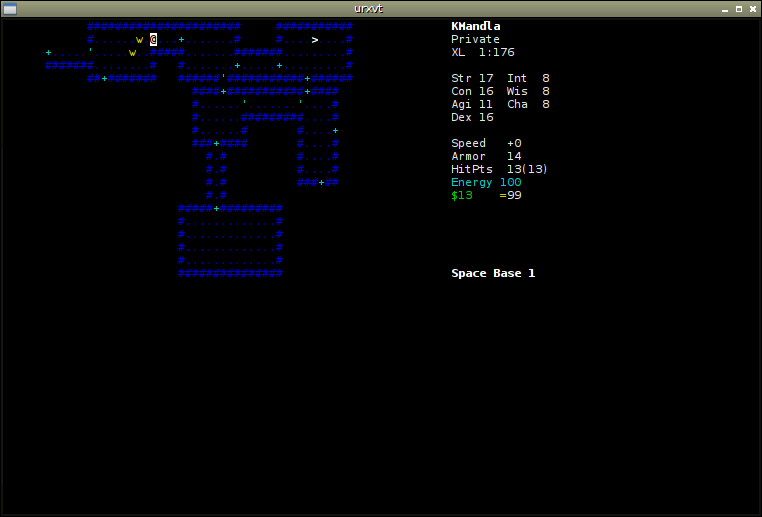 I guess both Gearhead and Cataclysm DDA are exceptions too, but those seem to transcend the “roguelike” label for me, and become something more like proper role-playing games. If we have to stick closer to the definition, then zapm is a possible variation on the usual swords-and-sorcery theme. zapm lets you take the role of a space marine, a psionic talent, a janitor or a number of other sci-fi stereotypes, and meander through a space base in search of fame and fortune. zapm seems simplified after the complexities of some roguelikes we saw last month, and you might want to press O to set some options, since it defaults to a keypad arrangement for directional controls, a la avanor. Otherwise much of the game plays in the same way as fantasy-based roguelikes, with obvious renaming where certain objects or monsters wouldn’t make as much sense. At the same time though, zapm seems not to take itself too seriously, which is probably a good thing. I don’t have a whole lot to say about zapm that I haven’t mentioned in the other dozen roguelike games I’ve listed in the past month, but that’s not necessarily a bad thing. If fantasy themes aren’t your cup of tea, or if you just want a change in atmosphere, zapm can provide enough sci-fi variation to keep you entertained for a while. This entry was posted in Linux and tagged game on 2014/11/28 by K.Mandla.